"Almatel Kazakhstan" is one of the biggest telecommunication companies in Kazakhstan working under the trademark "ALMA TV", which audience covers more than half a million users. A company provides all kinds of TV services and organizes retranslation of more than 150 channels from all over the world in a digital format, including 30 HD channels. Reception of TS with HEVC video from a satellite, transcoding and broadcasting it to different client devices located at 16 regions. 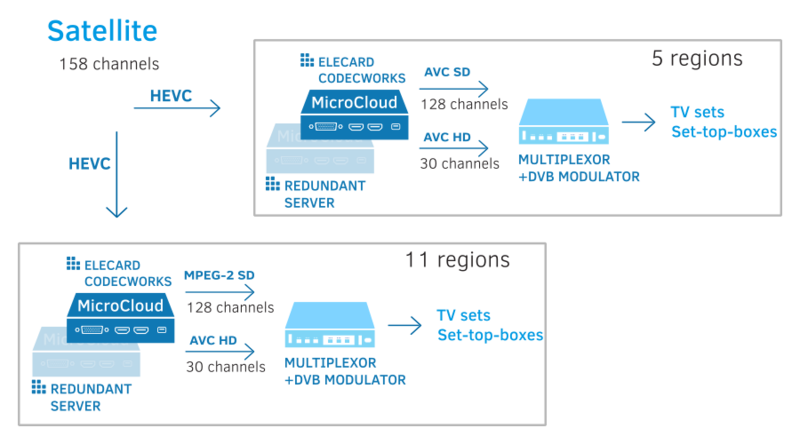 Implementation of a system for receiving HEVC/H.265 streams from the satellite across regions, high-density transcoding and delivery of the content in MPEG-2 and MPEG-4 formats to end-users' playback devices. A transcoding solution based on a powerful software transcoder Elecard CodecWorks and MicroCloud server provided by Supermicro. Configuration of the encoding schemes using redundancy mode. High-density transcoding at a 3U server. "Elecard high-density transcoding solution based on Supermicro blade system made it possible to transcode all our channels in each region on a 3U server. This solution is power-efficient and space effective, while there is no any visible quality degradation. Our benefit is evident as we shouldn't spend money on new end-user devices." Professional platform for real-time encoding and transcoding into HEVC/H.265, AVC/H.264 and MPEG-2 video supporting adaptive bitrate streaming via HLS and MPEG-DASH protocols with the best possible quality.